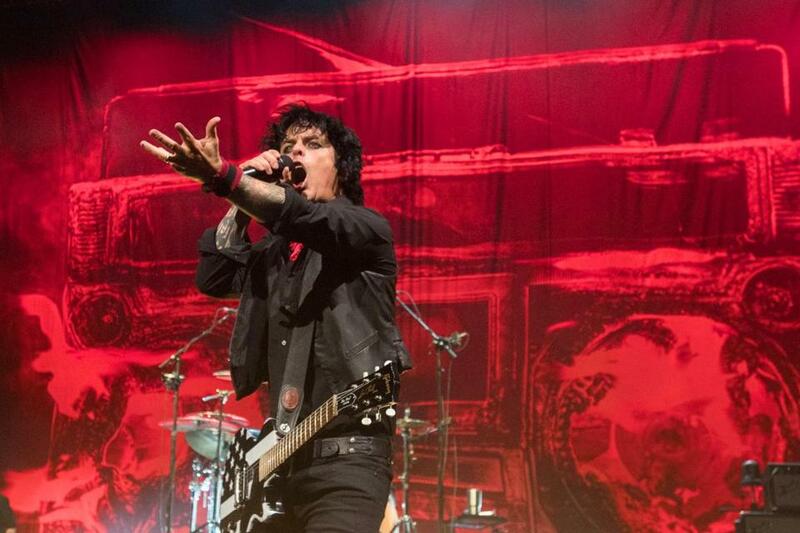 Green Day’s Billie Joe Armstrong performed at the Xfinity Center in Mansfield. MANSFIELD — Green Day came of age in a mid-’80s punk scene whose members would have viewed much of the band’s show at Xfinity Center on Monday — like the heavy use of pyrotechnics, including choreographed bursts of flame licking upwards behind the band — with derision. But there’s no getting around the contradiction embedded in the band’s pop-punk sound. Punk emerged as an almost Dada-esque rejection of the baroque, self-consciously intellectual rock establishment. Green Day’s version builds on punk’s energy, breakneck tempos, and general anti-authoritarian ethos, but sweetens it with Billie Joe Armstrong’s meticulously tuneful vocals while sorting through the detritus of prog-rock excess for pieces that suit. The first of its two rock operas, “American Idiot,” is an artistic pinnacle (and arguably a high point of the genre) — and was turned into a fully credible rock musical on Broadway. When the band pairs acoustic guitar and string quartet, as on “Good Riddance (Time of Your Life)” or “Boulevard of Broken Dreams,” it’s hard to argue with the lighter-raising results. So when Armstrong simply can’t stop calling for arm-waving and clap-alongs, as on Monday night in Mansfield, there’s little an audience member can do but comply. Because it’s fun. And when the show is proceeded by an audience sing-along to a recording of Queen’s “Bohemian Rhapsody,” you just go along with that, too. For all of Green Day’s welcome political edge, the band seemed determined to fully redeem the concept of big, broad, arena/ampitheater rock, bringing to a generous, two-hours-plus rock-a-thon as much energy as one imagines its members burned as teenagers playing warehouses in Oakland. Dorchester’s Abby Connolly (left) was brought on stage by Armstrong to help him sing a song during the concert. I found the group most musically convincing with fiery, self-contained rips through “She” and “The Waiting/St. Jimmy.” But looser moments, like three extended breaks to pull fans from the audience to help out onstage — cheers to little Lincoln for her vocals on “Basket Case,” and 15-year-old Calvin’s rock-star triumph playing Armstrong’s guitar on a cover of Operation Ivy’s “Knowledge” — felt like genuine efforts to undermine the band/audience barrier, in the best spirit of basement punk. The show was front-loaded with political messaging, including a chant-along mid-“Holiday” decrying Nazis, racism, sexism, and “[expletive] Donald Trump.” But moments later Armstrong insisted that “tonight is not going to be about some political head trip,” and offered the show’s joyous vibe as an escape from the latest troubling news out of Washington. This conception of Green Day as party band does not fully honor its creative depth, and gives short shrift to the paranoia and social dislocation that is so present in its lyrics and, I thought, integral to its identity. When your demonstration moves from the streets to a house party, don’t the ones in power win? Yet as “King For A Day” slipped into loose glosses on “Shout,” “Hey Jude” and “(I Can’t Get No) Satisfaction,” it felt like Armstrong had a point. Maybe the best counter to hate is not anger, but joy.